Most of us have seen this image of Coppola typing on an Olivetti DL, while he was working on his classic film; the Godfather. 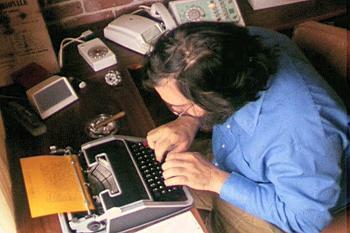 Well, it turns out that Coppola now has another typewriter out there that has become famous. Back when he was working on Apocalypse Now, another of his cinema masterpieces, close to the end of production he fled Tokyo in an rush. Unfortunately he left his typewriter in the hotel room that he was staying in at the time, never to be seen again – or so he thought. The typewriter turned up in October this year, when the owner of the hotel came forward at a press conference with Coppola, and presented him with the typewriter. Coppola signed it, and graciously gifted it back to the man. So, I did what every good writer and typewriter lover should do. I went out and tried to find what typewriter it was. 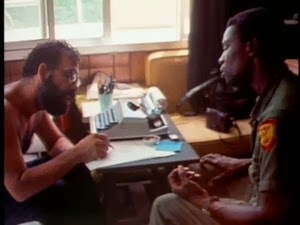 Sadly, I have only turned up an image taken from a documentary from the film ‘Hearts of Darkeness: The making of Apocalypse Now’. When I get a chance, I’ll see if I can find a copy of the documentary, and see if I can get a better image myself. I have seen the documentary many years ago, but I can barely remember it. Might be worth another look. Anyone got any ideas on what this machine is? December 17, 2013 in abandoned, Coppola, film, gifted, typewriter. ← The ‘Not a Valentine’ – Sottsass’s Olivetti leather and steel bad girl. That is really great about his typewriter. I have seen Apocalypse Now several times. Now I need to watch it to see if there is a typewriter in it. I was not aware of a documentary about the making of the movie. No Idea – West German maybe? Neckermann? The back section, at least, suggests a Messa. It is very worthwhile. The documentary is a classic film in its own right. 'Hearts of darkness' – go check it out. Interesting theory. The keyboard colour certainly stands up to that idea. Messa! Sounds possible. Although I have never seen one in that colour. Leading theory so far.